I am so pleased to have a guest post today from author Annette LeBlanc Cate, whose book, Look Up! Birdwatching in Your Own Backyard has just been released by Candlewick. It's a delightful, whimsical introduction to birdwatching, and I asked Annette to comment on how to get our kids outside! Birdwatching with Kids--Can Birds Beat Lego Star Wars? I have been a little worried, as my book Look Up! comes out... that someone would ask me why I thought to write a book about bird-watching for kids, and that I wouldn't really have anything more profound and clever to say than..."I just wanted to, and I thought kids would like it, and I thought it would be fun". Somewhere in middle of the 1990's I was the art director for an animated tv show, and although in some ways it was a deeply fun and happy time in my life... in others it was an excruciatingly horrible time in my life, fraught with soul-crushing deadlines, endless late nights staring into a computer screen til my eyeballs swam, drawing the same things over and over. Was I still an artist, if I did just draw these same cartoony characters over and over, and did that even matter? I worried that I was getting creatively bankrupt, and I also worried that I wasn't getting out of my dark basement much...i noticed that the only time I was outside was when i stumbled out to my car half asleep in the morning, and when I crawled back out to it, often late at night, and I thought, that can't be good for a person, especially someone who was supposed to be an artist. I needed to get out, and get some air. So I started walking at lunch, just to get outside, and, lucky for me, where I worked was right across the street from the Mt. Auburn Cemetery in Cambridge, Mass., which is a beautiful, famous old cemetery, filled with secret hidden dells and gardens. It's also filled with birds. I started to look forward to seeing them... so many I had never seen. Had they been here all along? I also made a real effort to try and draw things that were not the characters in the show... 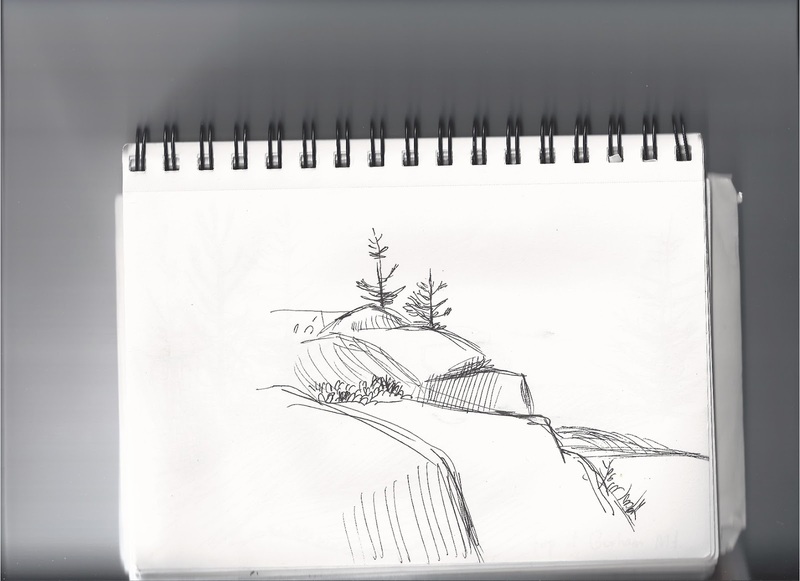 I started keeping sketchbooks, just for drawing outside.... and it had to be outside, even if I was just sitting and drawing the skunk cabbage in the swampy stuff behind my house. 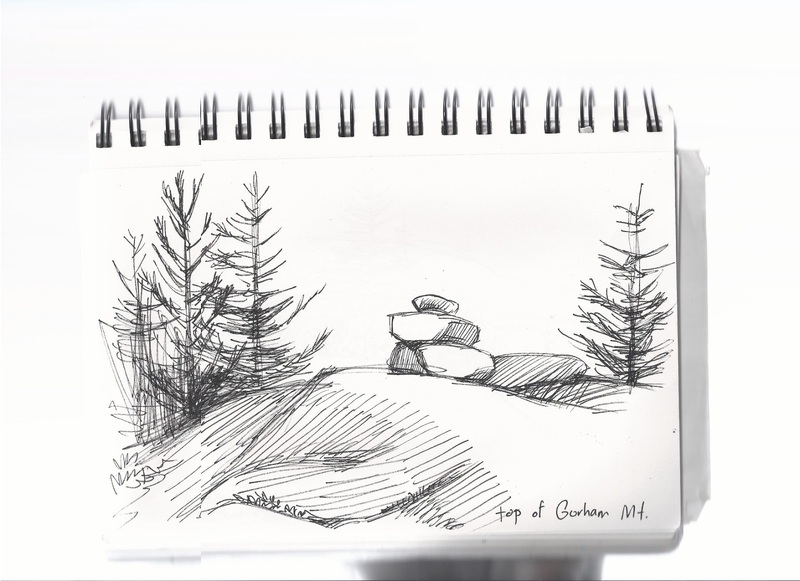 If you sit still on the edge of a swamp and draw skunk cabbage... you know, pretty soon you're going to see some birds. And that is just what happened... soon I was watching birds, and then I was drawing them. And then I bought my first little field guide...a Peterson's beginner's guide, and that was it for me. Soon I was going out of my way to find places where birds would be, I was looking just for them.... in my spare time when I was out drawing, walking at lunch, and even looking into the sky and the woods when stopped at red lights during my sluggishly long commute to work. There really were birds out there, everywhere, and the more I looked, the more I saw them. I feel they saved me a little bit...they got me out of that dark computer filled basement, got me thinking of light and trees and everything else that was out there in the world....and they were waiting for me when the show ended, and I left that job, and had my first baby. 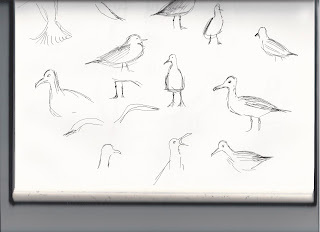 The bird book itself took years, and it grew out of the armloads of sketchbooks and notes. It grew from me reading field guides obsessively (is there any other way to properly read a field guide?) when I found I really needed to figure out what "breeding plumage" meant, because terms like that seemed to come up a lot. The more I cracked the code of field guides, figured out the secret language of birders, the deeper in I got, the more it all made sense, the more I loved it, the more I wanted to explain it.... because I guess I am just one of those people who likes to explain things. And I thought, really... a book about birds would be fun for kids. 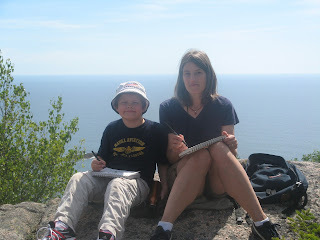 Birding is sort of a natural thing for kids....they like to know the names of things, and they pay attention to stuff most grownups don't have the time of day for... like bugs on the steps, and butterflies, and flowers pushing up through the pavement.... and and birds, too. Kids start out loving to be outside, just running around and looking at things and poking around in the dirt.... being so interested in all those creatures that creep and crawl and slither and fly. So what happens? Well, you know... life.... other kids...tv... video games.... soccer....that all happens. It creeps up. Your kids are no longer 5, now they see other kids with video games, and they decide they have to have Lego Star wars too, and who can blame them?. But can kids who love video games still love nature? Well... of course they can... but here's the catch... YOU have to love nature too, because that's how it works. We can, even with our older school-age children... influence (and by this i mean "make them") love what we love. So... if you want your kids to get out and love nature... well... you're going to have to get out there, too! 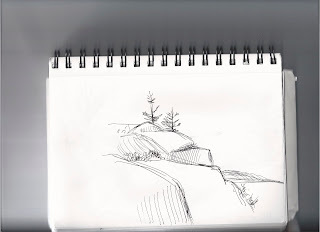 There are all sorts of ways to incorporate nature into your daily life... big ways, like, say, living in a house that abuts conservation land or spending vacations camping... and small ways... and I think the small ways are the best for starting any worthwhile endeavor. Nature is right outside the door... start by paying a little more attention, yourself. Maybe the next time you're sitting there after soccer practice you say to your kid... hey, why don't we just sit for a few minutes, nice just to sit, right? Is that a hawk up there on the lights? (and often, there really is one up there, have you ever noticed?) No need to hurry... because you're not in a hurry, right? Every grown-up knows there's always so much to do, so much to fit into the day... but maybe once in a while... you can just sit and look into the trees for a few minutes. Maybe you start by saying, hey let's just take a little walk around the neighborhood after dinner, or even just sit on the steps in the evening, maybe we'll see some birds flying by... or we'll watch the chickadees at the feeder. Maybe you'll see some birds... and maybe you won't... but the important thing is that you are outside with a kid, just spending some quiet time... and not in a ticking-something-off-the-list way... but in a way that says "I really like just being out here with you in nature, it's nice to just be here." You have to be content, and not rushed, and not in a hurry. Kids know when you are in a hurry.. and I think birds do, too. So slow down, and just be. Outside. And it doesn't hurt to buy a field guide and look up birds together, see what birds are native to your area... who lives in your yard? Going on a hike soon? Prepare first, say... hey, looks like we will be in the lair of the terrible Blue-winged Warbler, perhaps we'll see one! You might do a little homework yourself and make subtle suggestions about habitat and such... what birds might we see if we go to the mountains, or by a lake? Kids really are such clever and inquisitive creatures, just a few suggestions might be a good jumping-off point.... no need to make it a big learning thing (enough of that in school, I'm sure your kids will think) It's fun... and make sure you think it's fun, too. And maybe next time you'll say hey, look what I bought us, a sketchbook for you, and one for me, and these cool pencils, why don't we try a little nature drawing? And then you can draw horribly, and your kids will think that's funny, because they love when grownups do things horribly, and you can say yeah well the important thing is that i'm trying, and maybe you'll both have a good laugh and it will be a happy moment between two, or however many of you there are. 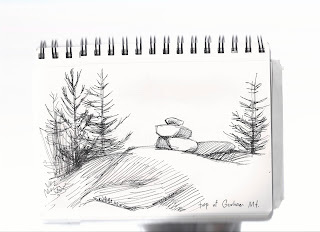 I hope you see lots of birds... or that you have fun just looking and drawing, just being together out in nature. Thanks so much, Annette, for your visit to The Fourth Musketeer! 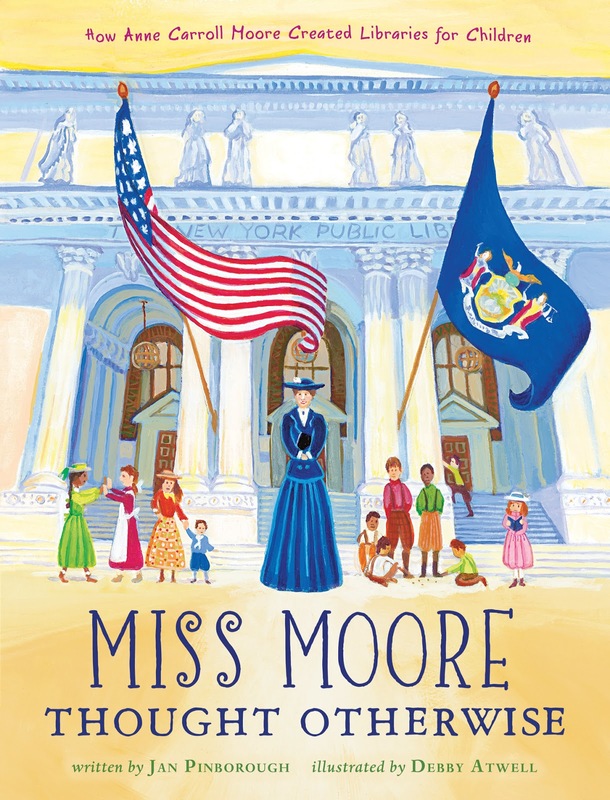 In her debut book for children, author Jan Pinborough offers a charming picture book biography of Anne Carroll Moore, an individual not well known among the general public but whose advocacy of library services for children are worthy of being celebrated in this handsome new volume released just in time for Women's History Month. The book begins almost like a fairy tale: "Once in a big house in Limerick, Maine, there lived a little girl named Annie Carroll Moore. She had large gray eyes, seven older brothers, and ideas of her own." We soon learn that Annie is a bit of a rebel, not content to do what a girl was supposed to do in those days. She loved books, but in those days children weren't allowed in the library. When she grew up, she went to New York City on her own to enroll in library school, and soon went to work in a library where they had something brand new--a room just for children, where Annie even read aloud to them. 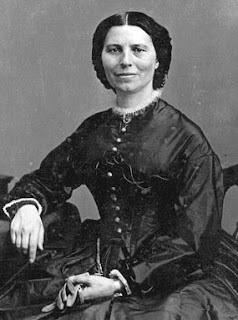 An advocate for children, she later became head of the children's rooms at the New York Public Library's many branches. At this time, children weren't allowed to take books home, since the librarians thought the children wouldn't bring them back. Pinborough portrays Anne Carroll Moore's feisty personality with a constant refrain in the book: "Miss Moore thought otherwise." When a grand new central library was built in the city of New York, Miss Moore was responsible for creating and designing the special place for children, complete with child-sized furniture. 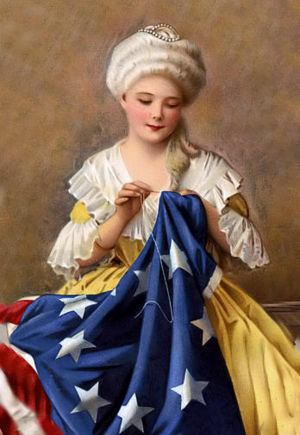 She brought authors, musicians and storytellers to entertain the children, and entertained them herself with her special doll Nicholas Knickerbocker and stories of his life. Even when she retired, she continued educating librarians across the country on how to create wonderful libraries for children. 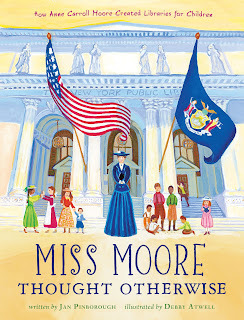 Back matter includes more details about Miss Moore, the "trailblazing librarian," and a list of sources. The lively artwork by Debby Atwell, executed with brightly colored acrylics in a folk-art influenced style, is a wonderful match for Pinborough's breezy writing style. Every children's librarian will want to have a copy of Pinborough's tribute to this remarkable woman on his or her shelf. She was a true hero for librarians and children everywhere! Check out the special website devoted to the book, an interview with the illustrator, Debby Atwell, at Kidsbiographers Blog, and watch for a special post by Jan Pinborough on Kidlit Celebrates Women's History Month on March 7! Lisa Taylor of Shelf-Employed and I are so proud to present the newest edition of our joint effort, Kidlit Celebrates Women's History Month, beginning today! We are very excited with the roster of distinguished authors and bloggers who have joined in our efforts this year. For a complete list of contributors, check out the right sidebar on the blog. Some of the authors and books that will be featured include Jane Yolen and her new release, Bad Girls, Jan Pinborough and her charming new picture book Miss Moore Thought Otherwise, Tanya Lee Stone and her new book Who Says Women Can't Be Doctors?, Renee Watson and Harlem's Little Blackbird, and so many more. Some of the blogs whose authors will be contributing this year are Read Roger, Hope is the Word, Bay Views and More, the Reading Tub, and Pink Me. This year's posts are sure to be as fascinating as in the past. Here at the Fourth Musketeer, I will also be reviewing a number of new women's history related books this month, so look out for those as well. 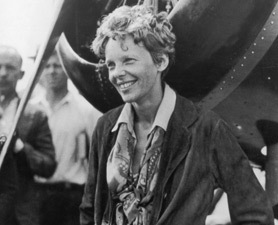 Since I grew up in an era when girls were lucky to find a biography of Amelia Earhart, Florence Nightingale, Clara Barton, and maybe Betsy Ross in the school library, I am overwhelmed by all the wonderful resources that are out there for today's girls. 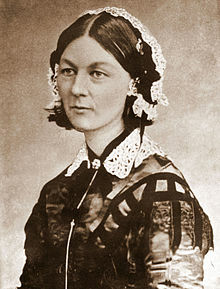 I am grateful to the many wonderful authors who not only write about the iconic figures of women's history, but also about the lesser-known women who are also outstanding role models for our girls of today. You, too, can learn about some of these terrific resources by following Kidlit Celebrates Women's History Month. And please pass on the word to others who might be interested, especially the gatekeepers who are often the ones who put books into the hands of kids: teachers, parents, and of course, librarians!